Death sentence was officially abolished in Uzbekistan on January 1. 2008. Mothers Against Death Sentence and Torture, an organization Tamara Chikunova founded in 2000, has been fighting capital punishment tooth and claw for nearly eight years. Tamara Ivanovna Chikunova was born in Tashkent in 1948. Officer's wife, she lived beyond Uzbekistan between 1971 and 1993. A citizen of the Russian Federation, she lives in Uzbekistan on a permanent basis now. 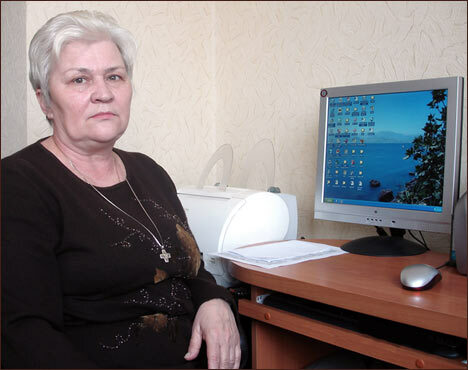 Tamara Chikunova has been campaigning for abolition of capital punishment in Uzbekistan and other countries since 2000 when her only son Dmitry Chikunov was executed. Her dedication and activeness earned Chikunova prestigious international awards including Golden Doves for Peace (2004), La Donna Dell'Anno (2004), Mimoza d'Ora (2005), Nuremberg (2005), Medal of the French Republic, Liberty-Equality-Brotherhood, For Work on Human Rights and World. Ferghana.Ru: The organization you established has been fighting death sentence in Uzbekistan for nearly eight years. It finally happened. Is your goal accomplished then? Tamara Chikunova: Not exactly. Sure, we want death sentence abolished as penalty in the Republic of Uzbekistan. As members of the global coalition Together Against Capital Punishment, however, we want a worldwide moratorium on capital punishment. It was abolished in Kyrgyzstan last year. In the meantime, there are post-Soviet countries yet (Belarus, Kazakhstan, Russia, Tajikistan) were capital punishment was never abolished. Where Uzbekistan is concerned, nobody has been executed here since January 1. On the other hand, the law itself was never published - and neither was the law enforcement practice. We do not know therefore exactly how the law is supposed to be applied. Ferghana.Ru: What do you mean by "practice"? Tamara Chikunova: I had a chance to read the law once. It specifies life sentence and imprisonment for 20-25 years as exceptional measures of punishment. Exactly when a person is entitled to 20-25 years or life sentence, however, is something to be explained by commentary to the law. Forty-eight persons sentenced to death occupy cells in Tashkent Jail these days. Their verdicts will have to be revised now. Before taking up their cases, we need to know the law enforcement practice. In other words, we need to know which of them may draw life sentences now and which imprisonment for 20-25 years. Along with everything else, the law that abolishes capital sentence stipulates the right to pardon. What does it mean? Release or a milder security regime? Again, it is not clear. The law "On abolition of capital punishment in the Republic of Uzbekistan" does include several commendable points. For example, it encourages self-education. A person sentenced to 20-25 years behind the bars with a record of self-education is entitled to pardon after 15 years, one sentenced to life imprisonment after 20 years. On the other hand, the law is vague on what constitutes pardon - release or a milder regime. Ferghana.Ru: Is this problem pressing for Uzbekistan? How many death sentences were passed in Uzbekistan every year? How many executions were carried out? Tamara Chikunova: I cannot give you exact figures because everything in connection with capital punishment remains a deep dark secret. The Uzbek authorities have never shared this information despite missives from the UN Committee for Human Rights. Needless to say, we wish for more transparency and openness pertaining death sentence. I'd like to urge Uzbekistan and President Karimov to publish the data on the executed and burial sites. I have another plea to make as well. It concerns the people sentenced to death before January 1, 2008. Do not sentence them to life imprisonment. Life on the death row, all this waiting for the execution, is nothing short of torture. All these people have been subjected to it. Ferghana.Ru: I read once that according to the data compiled by Mothers Against Death Sentence and Torture, almost 200 executions are carried out in Uzbekistan every year. Tamara Chikunova: We've never published any such information. In all my speeches and works I always refer to the words the president said on the eve of the parliamentary election in December 2004. "About 100 people are executed in Uzbekistan every year," he said. As for the death rows, they existed in Tashkent, Kattakurgan (Samarkand region), Khorezm, Andijan, and Termez. I learned it from families of the people sentenced to death. As for the exact figures on how many people were executed, we do not have any. Ferghana.Ru: What are the chances of judicial errors? Tamara Chikunova: Consider my son's case. In March 2007, the UN ruled that right to life had been encroached on by unfair trial, violation of his right to defense, and torture. How fair would you call the verdict he drew? Unfortunately, I know of a great deal of similar sentences. Sentences are often passed on the basis of circumstantial evidence. Presumption of innocence is frequently ignored. All of that results in unfair verdicts. Ferghana.Ru: What is the ratio of crime detection in connection with the crime punishable by death? Tamara Chikunova: Crime detection in Uzbekistan is almost 99%, which is quite high. Ferghana.Ru: Is that good or bad? Tamara Chikunova: It depends. I know for example that law enforcement agencies the world over solve only 16-30% crimes punishable by death. I do not think that Uzbek law enforcement agencies are so great as to report 99% crimes solved, or that the investigation practices are so impeccable... For example, they do not run DNA analyses in Uzbekistan. I hear that they do blood type analyses, but that's not sufficient of course. Forensic laboratories leave much to be desired. In short, errors are possible. When performance of law enforcement agencies is gauged by the number of crimes they solve, it's wrong of course. It compels them to boost the crime detection ratio no matter what it takes. It is only reasonable therefore to doubt the figures law enforcement agencies report. Consider torture in the course of investigation. It is punishable by no more than five years imprisonment (Article 235 of the Penal Code). As a matter of fact, it is only low-ranking officials who get prosecuted for torture. They are either fired or reassigned. Needless to say, it does not solve the problem at all. The Penal Code should be amended, and punishment for torture should be stiffened. Ferghana.Ru: Is it possible to challenge death sentence and have the verdict revised? Tamara Chikunova: It's very difficult. Death sentences were carried out fast before 2005. My son was executed seven months after the trial that sentenced him to death. The trial took place in November 1999, and my son was executed on July 10, 2000. I have evidence that at least 22 people sentenced to death were executed just when we were trying to have their sentences amended. Some were executed five months after the trial, some six months, some ten... It takes longer than that to have verdicts revised. Ferghana.Ru: And how much does it cost to have a death sentence lifted? Are there any unofficial tariffs? Tamara Chikunova: "We are not going to sentence the man to death, but it will cost you" is what suspects' families are usually told during the investigation or even trial. Following that, families are inevitably asked to bring this or that sum for the investigator or judge and pass it on via intermediaries. It is not a guarantee, unfortunately. All too frequently, it is banal extortion. There was another episode as well when the court had ruled and the suspect's family was told to bring $2,000 that would amend the sentence. They were told that the verdict would be amended within ten days if they brought the money when, as a matter of fact, it was ten days when they could challenge the verdict acting through official channels. The family brought the money and was predictably shocked when the verdict was left unchanged. Actually, the sums extortionists sometimes require are truly fantastic by Uzbek standards - $20,000 or even $60,000. Ferghana.Ru: Do these extortionists say that it will ensure a milder verdict and not death sentence? Tamara Chikunova: Yes, they do. But money does not solve the problem. Practice shows that this is plain extortion and nothing else. The families are shocked to learn that their kin is about to be sentenced to capital punishment. They do not - cannot - think straight. I know of episodes when people sell everything and remain literally under the open sky just on this off chance to help their relatives. Tamara Chikunova: Quite predictable. The verdict stood, people were executed. Can you imagine the shock these people experienced! Ferghana.Ru: Convicts sentenced to death in Uzbekistan face a firing squad, right? Tamara Chikunova: Yes, as specified by the law. When the Soviet Union disintegrated, the Uzbek Penal Code was extremely stiff at first. Practically every article of the Penal Code permitted capital punishment for a repeated offense. Even for car thefts, not to mention trafficking. When the capital punishment was finally abolished, the Penal Code had only two articles in it dealing with crimes punishable by death. Abolition of death sentence left the powers-that-be without a considerable source of income, you know. Existence of death sentence enabled them to deal in human lives. No more, fortunately. Sure, they may accept bribes for lighter sentences nowadays, but that's not actual lives we are talking about. Tamara Chikunova: Yes, both the number of death sentences and executions themselves constitute a state secret. Neither convicts nor their families know the date of execution. Even burial sites are a secret. Before you ask, I do not know why. I can only guess. One hears lots of rumors, but I do not want to repeat them here. I lost my only son. I cannot even visit his grave, you know, and that's the worst possible torture. Neither am I the only mother who lost her child. Ferghana.Ru: Is that legacy of the Soviet past or something invented by sovereign Uzbekistan? Tamara Chikunova: It's hard for me to judge. I never even realized the true scope of the problem before 1999. I'd like people to know that nobody is really safe, and that it is wrong to sit tight doing nothing. This is a problem that warrants immediate attention. Ferghana.Ru: I hear that when someone sentenced to death continues to plead innocent, the department of pardons does not even consider this person's case afterwards. Tamara Chikunova: You hear correct. As a matter of fact, it is not only in Uzbekistan. I talked to chairman of the Kazakh commission for pardon once. This official is convinced that when a convict pleads innocent even when sentenced to death, it means that he does not repent, and since he does not repent, he does not deserve pardon. It's surely wrong, if you ask me. Why would the departments of pardon deny this person their time and attention? How come this "I'm innocent" is invariably treated as an attempt to dodge penalty and not as a plea for help? Ferghana.Ru: Are pardons granted by the president alone? Ferghana.Ru: Has the president of Uzbekistan pardoned anyone yet? Tamara Chikunova: I hear he pardoned chief warden of the colony in Karaulbazar. The man was sentenced to death for crimes committed in the colony. Some kingpin or other was murdered there, and his murder fomented riots where some others got killed. Chief warden got the blame. Several convicts, participants in the riot, stood trial too. Well, he was pardoned, but the convicts were executed. It happened in 2000. Ferghana.Ru: Do you know anything about foreigners serving time in Uzbekistan? Do their native countries try to do something about these people? Tamara Chikunova: I have some data on citizens of Russia. Apart from my son, I know of four other citizens of Russia sentenced to death in Uzbekistan. Only one of them got off the hook. He is Marat Rakhmanov, whose death sentence was amended for 20 years behind the bars. Rakhmanov owes it to Russian Ambassador Mr. Ryurikov. It was Mr. Ryurikov and one Schukin of the Consulate who brought up the matter of Russian citizens in Uzbek jails. I know of episodes - truly unprecedented - when the Embassy of the Russian Federation intervened upon discovering that a suspect had been tortured. It was this interference that spared the convict death sentence. Unfortunately, Mr. Ryurikov was recalled and one Mukhametshin came in his place. With him running the Embassy, all efforts on behalf of the Russians facing trial in Uzbekistan is purely nominal. Under Mr. Ryurikov, Consulate officials regularly visited penitentiary establishments on a lookout for unfairly sentenced Russians. Whenever one was discovered, the Consulate did what it could to have the verdict amended. I haven't heard of any such episode these last four years, with Mukhametshin being the ambassador. As a matter of fact, even my appeals to Mukhametshin are never acknowledged. If I may, I'd like to remind the Embassy of the Russian Federation in Uzbekistan to remember citizens of Russia serving time in jails and colonies here. After all, the Embassy is here to promote geopolitical and economic interests of the Russian Federation. Ferghana.Ru: Will your organization continue doing what it has been doing now that capital punishment in Uzbekistan is abolished? Tamara Chikunova: We are also fighting torture, be it physical or psychological. As a matter of fact, psychological pressure is even more difficult to endure than purely physical torture. Whenever a person is told in the course of the investigation that something untoward might happen to his family... that's horrible. People snap, you know. Our organization remains active now that capital punishment is abolished. It's just that now we are focused on prevention of torture with regard to the people sentenced to death. Their verdicts cannot be carried out now, but they have to be revised yet. Along with everything else, we will continue fighting for a stiffer penalty for torturers. We view torture as encroachment on life, and that's not something we are going to put up with. Ferghana.Ru: How have the authorities been treating you? Do they help, create obstacles, or just ignore? Tamara Chikunova: They deny us registration. Last time our application was turned down in 2006. We were told that capital punishment was about to be abolished and advised to change the name of the organization. As a matter of fact, we are registered as a member of the global coalition Together Against Capital Punishment. Our organization is known in many countries of the world as a structure fighting capital punishment throughout the world and not just in Uzbekistan alone. Anyway, I think that we will apply for registration as Mothers For Human Rights now. This is our priority, after all, this is what we promote - observance of human rights and no more torture. Tamara Chikunova: Yes. It was to be a major conference attended by representatives of the Uzbek state, EU countries, and international experts. The problem of death sentence was on the agenda. The conference was called "Death Sentence: Analysis, Tendencies. Realities". We organized everything, but the authorities banned the conference barely twenty hours before it was due to begin when all EU representatives were here already. All I can say, is that this decision of the Uzbek authorities to ban the conference merely attracted the attention of the international community and elevated discussion of the problem of capital punishment in Uzbekistan to the international level. Tamara Chikunova: I cannot say for sure exactly who in the corridors of power had objected to abolition of capital punishment. Not even the human rights community was unanimous on the issue, you know... All I know about all countries where capital punishment was abolished is that the abolition was initiated by the authorities themselves, by national leaders. Even moratoriums on death sentences were introduced on national leaders' initiatives everywhere. I frequently hear that the decision of the president and his decree [to abolish capital punishment - Ferghana.Ru] was fomented by the events in Andijan. Perhaps, but it had been in the course of the parliamentary election in December 2004 that the president said in an interview that he himself was against capital punishment. The decree abolishing it saw the light of the day six months later. Between September and December 2004 Dilobar Hudoiberganova and I toured countries of the European Union urging the international community to concentrate on the use of capital punishment in Uzbekistan and Belarus. We collected signatures on petitions, attended conferences, met with representatives of governments, foreign ministries, ombudsmen, international human rights organization, etc., and asked them all to appeal to the Uzbek authorities to abolish capital punishment. This campaign was coordinated by Community of Sant'Edigio from Rome and Amnesty International (its central office in London). These organizations had worked out this program for us and helped us through the campaign. Offices of Sant'Edigio and Amnesty International everywhere were of great help. They arranged meetings and conferences, organized rallies, collected signatures... These and other human rights organizations kept faxing cables and letters to the president of Uzbekistan and other state structures with the request to abolish capital punishment. I know for a fact that Uzbek officials were literally showered with petitions. "We were compelled to take them out by truckloads!" they used to say. Their offices were even forced to change their fax numbers. Ferghana.Ru: How many convicts did your organization save? Tamara Chikunova: Twenty-two. We made appeals to state structures on behalf of their families, helped them out with paperwork, provided lawyers... Our pleases were heard and heeded. When the Republic of Uzbekistan abolished death sentenced, it spared the lives of all these people.